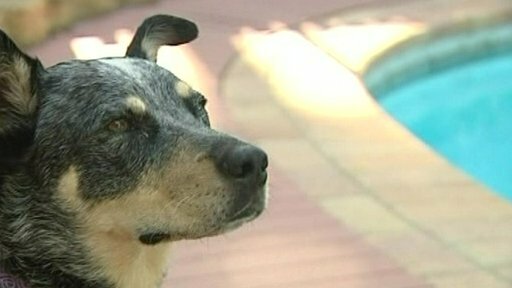 A pet dog which was washed overboard and believed drowned has been found four months later - as a castaway on a remote Australian island. Sophie Tucker - named after the famous US entertainer - vanished as Jan and Dave Griffith sailed through stormy waters off Queensland last November. But unknown to her grieving owners, the plucky dog survived a long swim across shark-infested waters to an island. There she lived on a diet of baby goats until being found by visiting rangers. The Griffiths were amazed to hear of the discovery and have now been reunited with their pet. "She surprised us all," said Jan Griffith. "She was a house dog and look what she's done, she has swum over five nautical miles, she has managed to live off the land all on her own. We wish she could talk, we truly do." The Griffiths had been on a sailing holiday off the north-east Queensland coast when Sophie Tucker - an Australian cattle dog - was lost overboard. "We hit a rough patch and when we turned around the dog was gone," Mrs Griffith said. "We were able to back-track to look for her, but because it was a grey day, we just couldn't find her and we searched for well over an hour. "We thought that once she had hit the water she would have been gone because the wake from the boat was so big." But the hardy dog had swum five nautical miles to be washed up on the largely uninhabited St Bees Island. 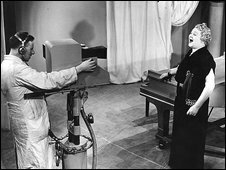 There, Sophie Tucker survived on a diet of baby goats until rangers, who patrol the island, spotted her. They eventually captured her, believing her to be a wild dog until they were contacted by the Griffiths. "She was seen on St Bees looking pretty poor and then all of a sudden she started to look good and that was when they discovered she was eating baby goats," Mrs Griffith said. "She had become quite wild and vicious. She wouldn't let anyone go near her or touch her. She wouldn't take food from anyone." There was an emotional reunion when the Griffiths met the rangers' boat bringing Sophie Tucker to the mainland. "We called the dog and she started whimpering and banging the cage and when they let her out she just about flattened us," Mrs Griffith told the AAP news agency. Mrs Griffith added that Sophie Tucker had been quick to readjust to the comforts of home.